L-Glutamine – the most abundant amino acid in the human body – is involved in many metabolic processes, including the synthesis and protection of muscle tissue, the production of glycogen, and immune support during periods of immune and muscular stress. L-Glutamine is also a major source of fuel for enterocytes (intestinal cells) and hence supports the integrity of the intestinal lining. Packaged by weight, not by volume. Mix 1 scoop (approximately 2 grams) into 6 to 8 oz. of fluid and drink when stomach is empty or as directed by your qualified health care consultant. For athletes, maximal results will be obtained by supplementing with 2 grams of glutamine after exercise. NOTE: If you have a medical condition, are pregnant, lactating, trying to conceive, or taking medications (including psychotropic medications), consult your qualified health care practitioner before using this product. 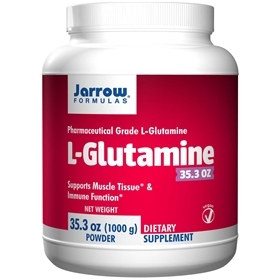 Jarrow FORMULAS L-Glutamine is manufactured by microbiological fermentation and is USP/FCC grade. This product is 100% L-Glutamine and contains NO other substance. Store in a cool, dry place. DO NOT refrigerate.